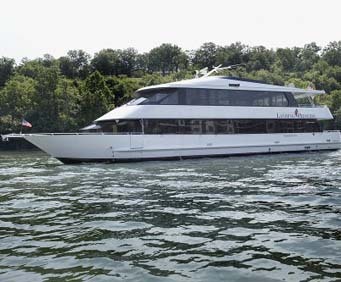 Being aboard the luxurious Landing Princess yacht is the most elegant way to float across Lake Taneycomo and the 2,000-acre Branson Landing waterfront. This 100' masterful design features two decks of climate controlled seating area as well as an outdoor upper sun deck. 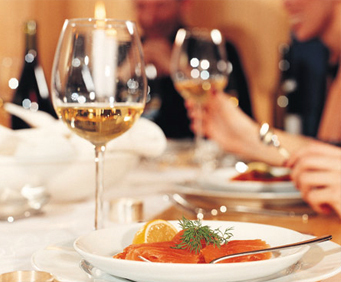 The Princess is by far the most fashionable and memorable dinner experience that you will find in Branson. 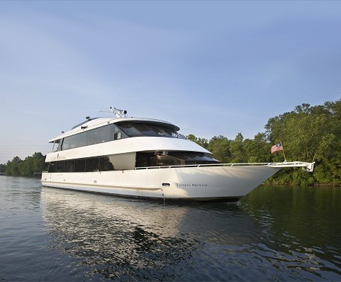 In addition to the stylish accommodations of the yacht, each voyage will also include the commentary of a guide who will narrate the history and culture of the Ozarks as well as how Branson got it beginnings and evolved into the heavily toured city it is today. Cruising the lake has never been this entertaining and informative. 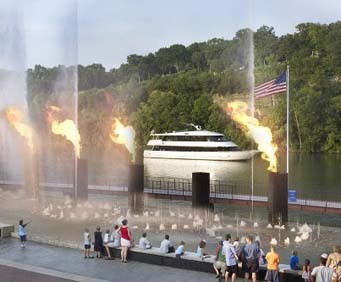 Along with the historical sites visited, the Princess will also stop by the Branson Landing Fountains for a $7.5 million dollar display of synchronized water, neon lights, music, and pyrotechnics. See options below for the different available tours. A delicious buffet with various Ozark treats like BBQ pulled pork will give you a wonderful meal to enjoy along with the scenic views of Lake Taneycomo. The Landing Princess will be your luxury yacht to explore for the evening, so you can get views from three of the open decks or relax at one of the cash bars aboard the boat. It's sure to be an evening you will always remember. Cruise lasts approximately 1.5 - 2 hours. Give your dad something special for Father's Day with a beautiful cruise out in the river on the Landing Princess. Enjoy complimentary champagne, barbecue baby back ribs, and a cash bar with seasonal specials. Join in the excitement as fireworks are lit off from Branson Landing's Liberty Light-Up Fireworks Display, with all kinds of fireworks to light up the evening sky, in addition to a delicious meal. Snacks will be available for purchase aboard the ship. Cruise lasts approximately 2 - 2.5 hours. Enjoy a delicious 'boat' cooked meal of roasted turkey , baked ham, mashed potatoes, sweet potatoes, mandarin orange salad, pumpkin and cheesecake! Beverages such as water and tea are available as well. There's no end to the excitement and anticipation on the Landing Princess on New Year's Eve, with plenty of dancing and fun music by your favorite D.J. In addition, you can make a midnight toast to this extraordinary occasion after the countdown is over. Watch the colorful fireworks light up the bay not far from your yacht while feasting on mouthwatering hors' d oeuvres and a huge dessert bar. Party favors will be provided and a cash bar with drink specials will be open throughout the night as well. This is an adults only cruise and lasts approximately 3 - 4 hours. Totally great experience. They did a really good job with seating the people with children separately on our trip which was a total pleasure for us! It was a nice yacht but no entertainment. I thought their was going to be a live performance or something. The food selection was minimal. We had 1 roll per person at the table. We don't eat pork so my husband and i could only eat the chicken and potatoes. They ran out of potatoes so my 350pound 6 ft 4 in husband could not get a 2nd plate. This was not good. They also had string beans with bacon and pulled pork on the buffet. The cruises left an hour late. The staff was friendly. We will not do this again. Maybe try the show boat next time. Excellent experience and wonderful food and service.